Essential College Comforter Insert for Dorm Room Duvet Cover Ultra Cozy Down Alternative Twin XL Duvet Insert Size 68" x 90"
The main purpose of your college duvet cover is to keep your Twin XL comforter safe from messes or damage. 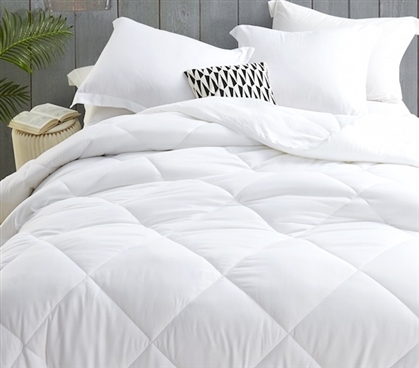 This makes it an essential part of your dorm bedding. But what if you're looking for a whole new college comforter insert for your new Twin XL duvet cover? You can get a comfortable extra long Twin comforter insert to go with your cozy Twin extra long duvet cover. Our Down Alternative - Ultra Cozy Duvet Insert - Twin XL (68" x 90") will give your extra comfy Twin XL bedding. This one-of-a-kind inner filling for your dorm duvet cover will help you relax on your dorm bed after a long day of classes. Made with a comfortable PolyFill down alternative inner fill and a luxuriously soft and noiseless 100% microfiber outer shell, you'll notice the difference when you add this ultra cozy Twin XL comforter duvet insert to your college duvet cover. The hypoallergenic fill also provides allergy sufferers with a change to experience comfortable down-like bedding without side effects. The 68" x 90" size of this essential Twin XL duvet insert will fit into many of our soft and stylish extra long Twin duvet covers!